Superstition is a weird deal. I don’t really buy it but I also can’t totally shake it. Played just a few ball games of various sorts when I could do that sort of thing and well, superstition kind of gets in your head from time to time. Where to stand when on deck, number of dribbles on a free throw, glove goes in a certain spot on the bench, mark your ball and replace before a putt, lucky socks, front foot out of the box between pitches…you get the picture. But those are what I call “habits” or “routine” so not superstitious, right? So, how about superstition and fishing? Folks, I’ve got a whole batch of notes on the topic in my “one of these days” folder. And I’ve gotta tell you, when the incident below occurred it honestly had me a little worried. You see, I’ve long viewed a bass on the first cast as more of a bad omen than a sign that you are going to knock ‘em dead. 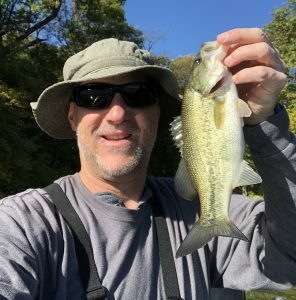 And a first cast bass on Lake Storey? Now that is almost unheard of. In reality, however, I would have to say that the concern is unfounded, pretty much like all of the standard (or odd) superstitious quirks that can influence people’s behavior. In fact, on this Lake Storey outing I wound up having a real solid day on a fishing hole that can sometimes be a tough one to figure out. Perhaps next time though I’ll choose a historically unproductive spot for my first cast just in case. You know, instead of the tree under the water, maybe toss that spinnerbait into one up on the bank.